The Eleven Eleven Central Phase I offering features five two-bedroom, two-bedroom plus den, and three-bedroom floor plans with covered outdoor balconies. The Ronto Group announced Baer’s Furniture and Interior Design’s Janet Graham, ASID has completed the preliminary interior design for the 303 furnished Belair model at Eleven Eleven Central, a new walkable/bikeable, access- controlled community to be built by the developer on Central Avenue between 10th Street and Goodlette-Frank Road in downtown Naples. The Belair is one of four furnished Phase I models Ronto will be presenting at Eleven Eleven Central. All four are under contract and will be available for viewing after completion of construction through a developer leaseback. 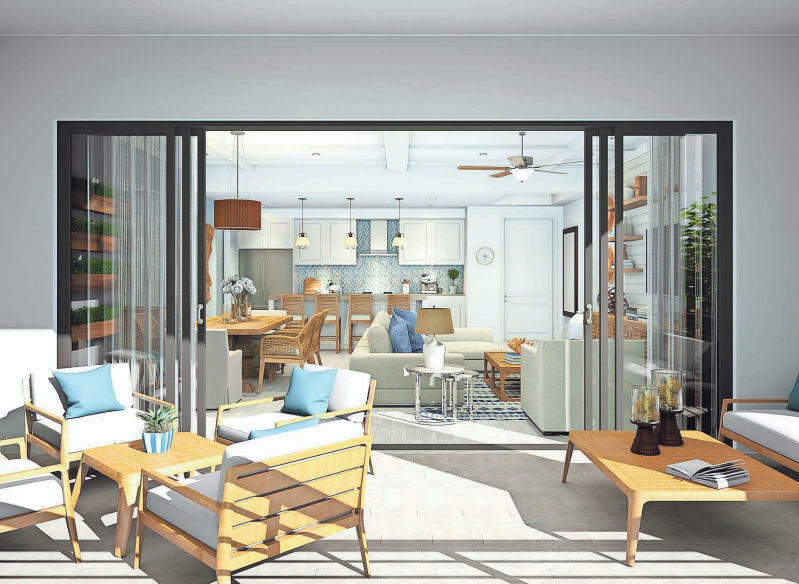 The Phase I offering features 62 residences showcasing five light-filled two-bedroom, two-bedroom plus den, and three-bedroom open-concept floor plans ranging from 1,407 to 2,297 square feet of living space, including covered outdoor balconies. Two of the floor plans, the Atlantic and the Avalon, are sold out. Pre-construction pricing on the remaining unsold residences starts at $725,000. Ronto anticipates beginning construction by the end of this year. Graham created a warm transitional contemporary interior for the Belair model. The model will feature a neighborhood view. With a total of 1,741 square feet of living space and 1,561 square feet under air, the Belair plan includes a large great room that opens to a covered balcony, a dining area, and an island kitchen. Base priced at $690,000, the plan also includes two bedrooms, two baths, a den, and a separate laundry room. Graham has included additional upper cabinetry to enhance the functionality of the laundry room. Her neutral color palette will present light gray backgrounds, white trim, and black accents. The flooring will be 8-by-20-inch linear porcelain tile with a beige and gray stripe. Graham will establish the Belair’s transitional contemporary look in the foyer with a mirrored Verre Églomisé furniture piece, a contemporary abstract art selection, and a chrome abstract flavored chandelier. The great room will open to the balcony and showcase a feature wall with floor to ceiling transitional style carpentry detailing that will be framed out to cover approximately 75 percent of the wall’s surface. A 94-inch long console will be placed under a large wall-mounted television. The console will be presented in a black mink finish on the top and sides with grey marble door fronts and heavy chrome handles. Furnishings will include a soft gray krypton fabric Bernhardt sofa with a return chaise on the right side, and a statement piece circular glass-topped cocktail table with a chrome border and blocks of mink-finished material that square off the corners. A side chair and ottoman will be finished in a gray and black starburst pattern fabric with chrome nail head details and black trim. A circular chrome hammered martini end table will be placed next to the side chair. Graham created a white ceiling detail that will consist of two four-inch wide boxes that will be dropped four inches beneath the ceiling and extend across the great room and adjacent dining area space. The outside box will be placed about 16 inches from the wall and the second will be about 18 inches from the wall. A chandelier will complete the look in the great room and compliment a similar lighting fixture in the dining area. To conserve space and enhance the Belair’s spacious feeling, the dining table will have legs at each corner that will allow the chairs to be stowed all the way underneath the table. The table will have a black mink veneer top with chrome details on both the top and the legs. The fabric on the chairs will also feature a chrome detail on the back. Counter stools at the kitchen’s island will be presented with a coordinating dark-toned base and a muted gray fabric on the seats and backs. Marbleized granite countertops will showcase gray, white, and beige earth tones that will play against white shaker style cabinetry with long vertical chrome pulls. A contemporary backsplash will feature glass subway tile in white, gray, and taupe. The den’s stark white built-in will offer an abstract design set against the room’s light gray wall tones. Cross beams will provide a geometric style background and feature a 42-inch television in the center. A desk with chrome pulls and minimal accessories will be beneath the television. Across from the built-in, a solid soft gray 36-inch wide and 72-inch tall sleeper sofa will open into a full-size queen sleeper and include accent pillows in shades of gray. The look will also include a contemporary style reading chair and an abstract painting in earthy shades of gray. A hallway off the owner’s suite vestibule will be flanked by walk-in closets and lead to a bedroom with varied textures and surfaces. The headboard wall will be graced by rich looking dark gray wallpaper while the other walls will be light gray. The headboard finished with light gray fabric will be 84 inches tall with channeled grooves every 8 to 10 inches. The footboard will be upholstered in the same material. A coordinating chair in the sitting area will be finished in the same light fabric. The draperies will be gray-modeled silk. Deco nightstands will have high-polished chrome hardware and a black mink finish. The dresser will have circular hardware and the same black mink finish. A starburst mirror will be above the dresser. The owner’s bath will feature the same wallpaper found on the headboard wall in bedroom while the water closet will be papered in a patterned print. A white shaker style double vanity will be finished with linear hardware and a variegated gray and white granite countertop. The porcelain tile flooring material will be carried into the shower where the walls will be accented by two 12-inch vertical rows of mosaic glass tile. Outside, the Belair model’s balcony will feature a contemporary style square dining table with four upholstered chairs. A table will separate two side chairs with ottomans. Scheduled for completion in Phase I, Eleven Eleven Central’s 60,000-squarefoot courtyard amenity deck will feature a 3,500-square-foot resort-style pool with a beach entry and two 90-foot lap lanes, chaise lounges and poolside tables, two spas, outdoor showers, poolside cabanas, numerous grills, a cabana bar and grilling area with large screen televisions, multiple fire pits with large built-in seating areas, a hammock lawn, a life-sized outdoor chess set, a yoga stretching area, and two bocce ball courts. The outdoor amenities will be expanded during Phase II to include a 20,400-square-foot landscaped Courtyard Park with park benches, a putting green, a yoga lawn, and fenced dog runs. Residents will also enjoy a 4,000- square foot club room with a bar, billiards tables, card tables, large screen televisions, and a catering kitchen adjacent to an outdoor grill and fire pit. A fitness center, also measuring 4,000 square feet will include a stretching and functional movement area, exercise equipment, massage rooms, and rest rooms. Six community guest suites will be provided. Resident storage areas and bike storage areas will be included. Two downtown Naples sales centers represent Eleven Eleven Central and Ronto’s Naples Square community, one located at 100 Goodlette-Frank Road S., the other in Unit 101 of the Naples Square Phase I building at 1030 Third Ave. S. Visit 1111Central.com or NaplesSquare. com.